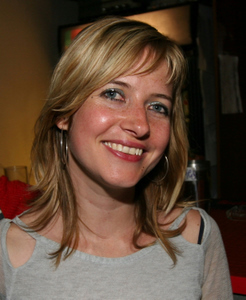 Lauren Beukes is most recently the author of Zoo City. Condition of Mr. Segundo: Avoiding roaming urban animals. Subjects Discussed: Jet lags and hangovers, cultural references, I Can Haz Cheeseburger, whether or not books should be of their time, American Psycho and Phil Collins, violence and cheeseball songs, hyper-specific description, William Gibson, the influence of writing for animation, the differences in writing journalism, comics, and screenplays, considering the right level of detail, action scenes vs. dialogue, Hanna, implausible action movie scenes, getting the geography of an apartment block, the ability to get journalistic answers from people when you say you’re a novelist, magic and fantasy rooted in practical limitations and innate talent, Red, a personal belief system as a peer review process, Johannesburg’s geography, Nechama Brodie’s The Joburg Book, conversations with traditional healers, worldbuilding and getting the reader to believe, major clues hidden within conversation, bad worldbuilding involving two guys sitting in a bar, writing as a road trip, having a planned ending in advance, alligators, reclusive music industry producers who are in decline, establishing Zinzi’s streetcred, arriving at the right balance between ambiguity and just enough information, unreliable narrators, Melinda Ferguson’s Smacked, cinematography and photography references within Zoo City and Moxyland, similes throughout Zoo City, Raymond Chandler, phantasmagorical noir, Oryx and Crake, the problems of reading fiction while writing fiction, South African criminal slang, steering away from transcribed speech, The Wire, relying on other writers for certain chapters of Zoo City, conducting interviews with fictional characters, the problems with theories contradicting fictional worlds, being the “head writer” of your own novel, The Third Man, Paul Bowles, visual references, and internalizing influence. Correspondent: Lauren, how are you doing? Beukes: I’m very, very, very jetlagged. Thank you for asking. Correspondent: Yes, well, I’m hungover as well. So I think it’s an equal playing field. I wanted to first of all start with the issue of cultural references. This book has quite a number of recent ones. “I can haz murder weapon.” I don’t think I’ve even seen “I can haz cheeseburger” in a novel ever. Lady Gaga: well that’s comparatively recent. The 419 scams. I’m curious. When you deploy a relatively recent cultural reference, you’re dealing with a two year lag time in terms of the book coming out. What do you do to make sure that it’s right? Or that it’s actually something that will possibly be tangible in a matter of years? Or do you have this virtue here, in this case, of a sideways universe, as it were? So that, as a result, whether a reference is dated or not, this is not so much a distinction or a problem. Beukes: I never really worried about references dating the book. I think books are of their time and I think they should be. You know, when I was doing my masters in creative writing at the University of Cape Town, my lecturer said, “You absolutely should not put any contemporary references. Because it dates the book horribly.” You know, The Great Gatsby has dated horribly. American Psycho has dated horribly. And they still work. Because the story is compelling enough and it’s actually a really interesting snapshot of the time. So, you know what, I don’t care. I like to think that it dates it. The book is set in 2011 and those are the cultural references. Correspondent: Interesting that you mention American Psycho. Because near the end, there’s a Phil Collins reference. So it leads me to wonder if that was a possible influence on getting that sort of juxtaposition of violence and cheeseball songs. Beukes: Yeah. I don’t know if it was conscious. But it might have been something that I internalized. Yeah. Correspondent: A two stroke gash across the face of a menacing street urchin. The Maltese’s car polished and waxed to within an inch of its warranty. This is hyperspecific, very measurement unit-like description. Which I like by the way. Reminiscent to some degree of William Gibson. However, at the same time, I know that you have also written for animation. And I’m curious if some of that animation writing background has affected your ability to describe things in this very ultra-precise matter. What of this? Correspondent: Do you take photographs of yourself? Beukes: No, I don’t. That would just be silly. But I should set up a webcam and kind of do a live streaming thing where people can log in and laugh at me. Correspondent: So you need to know the precise expression of what’s going down. And then you have the option to describe it in detail or not, whether for animation or for prose. Beukes: Absolutely. But I think journalism also has a lot to do with it. The details of journalism. And I think details make a story. I mean, I’m lucky to do a lot of — not news journalism, but narrative journalism and investigative features in finding those telling details. So I think my eye for detail probably comes from there. And then also the specifics of having to write for animation and having to track things very, very clearly and stage manage very clearly for the animators. Correspondent: Well, I mean, how much of this is an organic process? And how much of it is considering the right level of detail to communicate the right information to the reader? Beukes: I think it’s pretty organic. I don’t think about it too much. Dialogue comes very easy. Actions scenes are really hard — they don’t come naturally to me. I really have to work on them. Correspondent: Why are action scenes tougher than dialogue? Beukes: I don’t know. I think because I really like talking. You know, I’m a talker, not a fighter. I think dialogue is so much a part of who we are. And I really like using the subtext in dialogue. And of course, that’s very, very strong in animation. I think it’s also I’m not a really big action movie fan. And action has a lot to do with movement. I really enjoyed Hanna recently. I thought the way they did the action in there was just intense and amazing and surprising. And you really felt it. So many action scenes — you know, the truck falls off the bridge and there are multiple explosions. And they’re just empty. So it’s really trying to write meaningful action. Correspondent: Is fighting similar to gestures and facial expressions for you? Do you have to like roll on the ground to get a sense of how things are working out here? Correspondent: Do you have a sparring partner? Beukes: (laughs) No, no. I wish. I did a little bit of kickboxing, but that was years ago. Beukes: I do sometimes act certain stuff up, but not fight scenes. But I will really think about the choreography. And I’ll spend a lot of time thinking about it.